"Analyzes the role of peptides in promoting or suppressing inflammation. Thoroughly examines the therapeutic potential of key peptides, analogs, agonists, and antagonists that influence cell injury and repair." 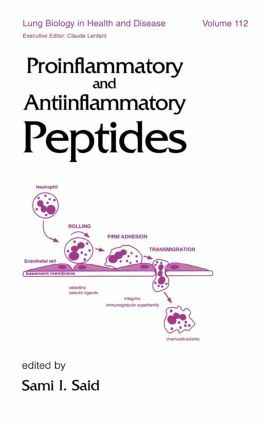 ". . .a thorough and scholarly account of the diverse roles that peptides can play in inflammation. The move in inflammation research will be made familiar with the important concept that inflammation is controlled not only by pro-inflammatory factors but also, and perhaps more importantly, from a therapeutic perspective, by anti-inflammatory checks and messengers. The more advanced researcher is provided with comprehensive overviews of pro- and anti-inflammatory peptides." Part 1 Cell injury and inflammation: inflammation, cell injury and apoptosis; proinflammatory and antiinflammatory response cytokines in the inflammatory response. Part 1 Proinflammatory peptides: proinflammatory peptides in sensory nerves of the airways; sensory neuropeptides and bronchial hyperresponsiveness; the tachykinin family of peptides and their receptors; endothelins in inflammation; endothelins in the lung; proinflammatory peptides in relation to other inflammatory mediators; cellular regulation of kinin receptors - potential roles in inflammation. Part 3 Antiinflammatory peptides: modulation of inflammatory effects of cytokines by the neuropeptide -MSH; regulation of VIP gene expression; neuroregulation of pulmonary immune responses by VIP and substance P; role of vasoactive intestinal peptide in myocardial ischaemia - reperfusion injury; antiinflammatory actions of VIP in the lungs and airways; VIP regulation of neuronal proliferation and differentiation; implications for neuronal repair; neurotrophic action of VIP - from CNS ontogeny to therapeutic strategy. Part 4 Modulation of peptide action - therapeutic applications: long-acting VIP analogs; catalytic anti-VIP antibodies and their relevance to the airways; enzymatic degradation of bradykinin; enzymatic modulation of the tachykinins and VIP in the lung; therapeutic effects and immunomodulatory activities of natriuretic peptides.